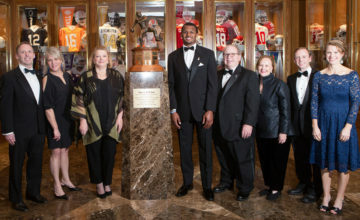 FORT WORTH, Texas (Nov. 12, 2018) – From its list of 16 semifinalists, the Davey O’Brien Foundation has announced its Great 8 quarterbacks for the 11th week of the college football season. 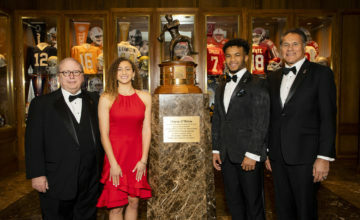 The eight honorees announced Monday by the Punt & Pass Podcast are: Will Grier of West Virginia, Houston’s D’Eriq King, Trevor Lawrence of Clemson, Utah State’s Jordan Love, Gardner Minshew of Washington State, UCF’s McKenzie Milton, Kyler Murray of Oklahoma and Michigan’s Shea Patterson. 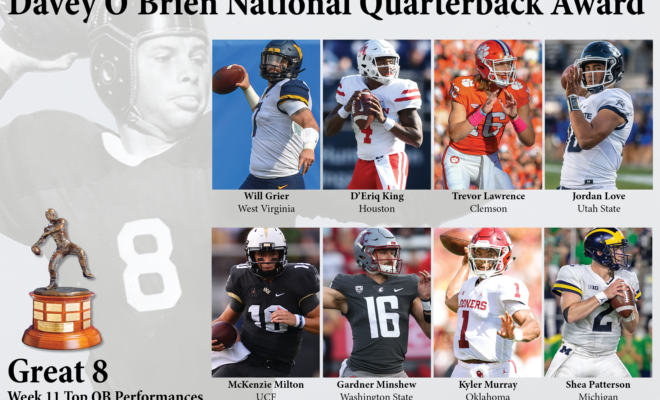 The winner of the Davey O’Brien National Quarterback of the Week Award, which will be one of the week’s Great 8 quarterbacks, will be announced Wednesday. 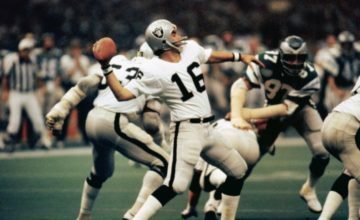 To listen to the announcement and discussion of this week’s Great 8 on the Punt & Pass Podcast, click here. Will Grier, West Virginia, Sr., 6-2, 223, Charlotte, N.C. Guided the Mountaineers to a 47-10 rout of TCU by going 25-for-39 for 343 yards and three touchdown tosses. Accounted for 447 total yards (322 passing, 125 rushing) and six touchdowns (five passing, one rushing) in a 59-49 loss to Temple. Trevor Lawrence, Clemson, Fr., 6-6, 215, Cartersville, Ga.
Was 29-for-40 for 295 yards and a score, and added a rushing touchdown, in a 27-7 win over No. 17 Boston College. Jordan Love, Utah State, So., 6-4, 225, Bakersfield, Calif. Threw for a career-high 491 yards (32 of 42) and five touchdowns and also ran for a score in a 62-24 victory over San Jose State. Completed 17 of 21 attempts for two yards and two scores, and carried seven times for 62 yards and a touchdown in a 35-24 win over Navy. Gardner Minshew, Washington State, Sr., 6-2, 220, Brandon, Miss. Led the Cougars to a 31-7 victory over Colorado by throwing for 335 yards on 35 of 58 passing, and totaling three touchdowns (two passing, one rushing). Completed 21 of 29 pass attempts for 349 yards and a touchdown, while also rushing 14 times for 66 yards. Shea Patterson, Michigan, Jr., 6-4, 205, Shreveport, La. Was 18 for 27 for 260 yards and three touchdowns as Michigan downed Rutgers, 42-7.